The second of C J Sansom’s Matthew Shardlake series sees the hunchback lawyer summoned once again to the aid of Chief Minister Thomas Cromwell. It’s 1540. London is sweating uncomfortably in an intense heatwave, the King is in pursuit of yet another bride more to his taste than Anne of Cleves and Cromwells hold on power looks increasingly precarious as his enemies circle and plot. He can keep them at bay and retain Henry’s favour if he can get his hands on a mysterious new weapon called Dark Fire or Greek Fire that could be a deciding factor if the French decide to wage war on Henry. Problem is, Dark Fire seems in short supply and the men who developed the formula have been murdered. Cromwell has only 12 days to find the formula and stage a demonstration for his royal master. There is only one man he can trust take on this quest, Shardlake. It’s three years since Shardlake was last pressed into service of the state, an experience that left him questioning his faith and his belief in religious reform. He’s much happier doing battle with the law on behalf of his clients than getting embroiled in political affairs. He has a particularly tough case on his hands already, defending Elizabeth Wentworth, young girl accused of murdering her cousin by throwing him down a well. Time is running out – if Shardlake can’t prove her innocence in the next 12 days, she will go to the gallows. But what Cromwell wants, Cromwell gets. The two plot lines combine into an intricate maze which sees Shardlake and his new assistant Jack Barak criss cross London, visiting stinking prison dungeons, the perfumed salons of the society elite and the whorehouses of Shoreditch in a series of chases and adventures that become increasingly dangerous. Shardlake complains of the pain he endures from his infirmity, but it doesn’t stop him clambering up walls, carrying women from burning buildings and throwing off would-be assailants. The pace is rapid, the list of potential villains lengthy and the solution satisfyingly unclear until the final pages. Sansom’s writing can be clunky at times but what makes amends for this is the introduction of Barak as Shardlake’s assistant. Like all good side kicks he exists to do the grunt work, like clambering down wells at dead of night or trawling the brothels and taverns for would be assassins and to act as a straight man when the brilliant detective needs to test a theory. Barak’s uncouth behaviour and propensity to be rude to anyone in authority, make him a great foil for Shardlake’s more considered, temperate nature. 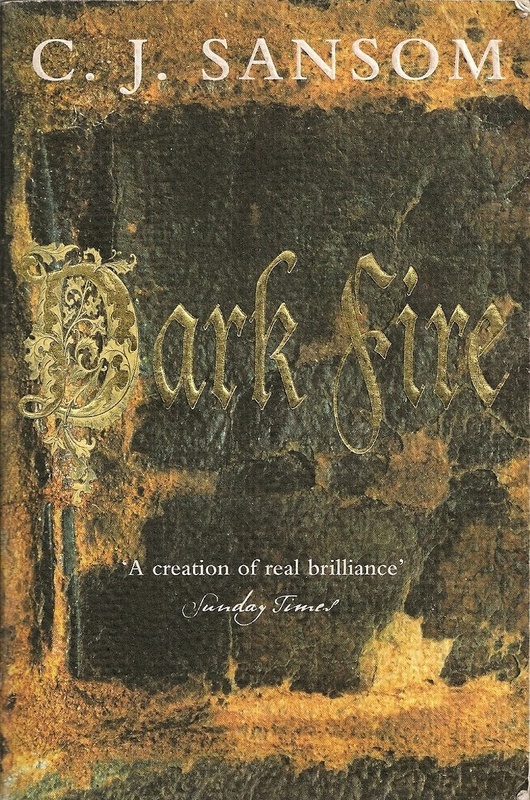 Shardlake’s own character is more finely tuned in Dark Fire. His desire to seek justice for the common man shown in Dissolution is still in evidence but now combines with his passion to expose the type of corruption that preys on the defenceless poor. We also get to see another side to Shardlake as he forms an affection a woman whose wealth and family status put her well above that of a lowly lawyer. Does she return his affection or is she really trying to hoodwink him as Barak maintains? Sansom keeps his readers guessing on this point as on so much else in a novel that is an even more enjoyable read than Dissolution. Posted on May 2, 2013, in Book Reviews, historical fiction and tagged Book Reviews, C J Sansom, Shardlake. Bookmark the permalink. 9 Comments. Great review! Love the way Shardlake develops through this series… I confess that these are among the books which can lure me into staying up very late at night to get finished, even on a reread! Still not been able to find an unabridged audiobook of any of the series, although the Anton Lesser reading is very good. Ooh lovely review! I have listened to Dissolution on audio book (found a cheap one in a discount store one day) and enjoyed it far more than I had imagined I would. I’ve been meaning to read through the whole series, as he struck me as top-end crime, really well written and fantastic historical detail.